Look, up in the sky! It&apos;s the excitement of daring men and their flying machines, captured at the Old Rhinebeck Aerodrome in Rhinebeck. 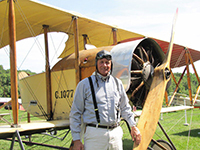 A living history museum of World War I and pioneer Lindberg-era aircraft (1900-1937), the Aerodrome showcases antique and replica planes in displays and theatrical air shows that include costumed performers and period cars (weekends June-October). Your kids will love the action, and barnstorming rides are available in open cockpit biplanes. So, don your goggles and helmet and head off into the wild blue yonder of Dutchess County! Are you or your kids roller coaster fans? Nothing beats the nostalgia of riding a wooden coaster. Capture that combination of thrill and old-fashioned fun this summer on the Dragon Coaster at Playland Amusement Park in Rye. One of the seven original rides still in operation at the historic park, the coaster shoots cars out of the dragon&apos;s mouth and down an 85-foot slope at speeds of up to 45 miles per hour. You&apos;ll also find modern amusements alongside the original boardwalk and pier as well as a public beach, swimming pool, mini-golf course, and indoor ice-skating rink. Motor sports fans - you&apos;ll certainly want to make a (pit) stop at Lebanon Valley Speedway in New Lebanon and Lebanon Valley Dragway in West Lebanon for the best in stock car and NHRA drag racing. How about some real adventure? Catamount Adventure Park is an aerial forest adventure with 12 courses including 50 zip lines and 170 platforms in trees which are connected by bridges of cable, wood and rope!